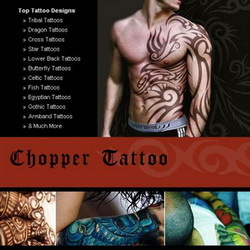 Flying butterfly tattoos are undeniably the most popular designs requested by women all over the world. If you have ever seen a lepidopterist’s display cabinets you might begin to understand why these beautiful creatures hold so much fascination for so many. For one thing, there are over twenty thousand known species of butterfly throughout the world, which engrosses collectors, and means over twenty thousand unique designs to choose from if you want to replicate the real thing. And if you want something more whimsical, you can choose your own colours and patterns and claim you have discovered a new species! It is true that most women choose flying butterfly tattoos because they are so elegant and beautiful, but they also have such enormous cultural significance all over the world that these creatures cannot help but captivate the imagination. You only have to watch a butterfly in flight as it flutters gracefully from flower to flower in search of nectar, to understand how easily myths and stories sprung up around this little creature. With their fairy-like gossamer wings, they were considered to be deities in some parts of the world. Colourful flower designs – with or without embellishments of elegant butterfly tattoos – account for the majority of tattoos favoured by women and it hardly takes the brain of a would-be Einstein to understand why. Butterflies are beautiful, graceful and colourful creatures that are rich in symbolic meaning. In the natural world, butterflies and flowers complement each other perfectly, so placing them together in a tattoo design represents all that is harmonious in nature. Both butterflies and flowers are symbolic of youth and awakening as both appear and flourish in spring time when the year casts off its dark winter mantle and takes on the lighter and brighter hues of its summer attire. Butterfly tattoos are extremely versatile and lend themselves to any colour combination, from monochrome to multi-coloured and, with their increasing popularity amongst young women and girls, some highly creative butterfly tattoo designs are now available. Butterfly tattoos allow for a great deal of experimentation, not just with colour but also with shape and design, as well as size. 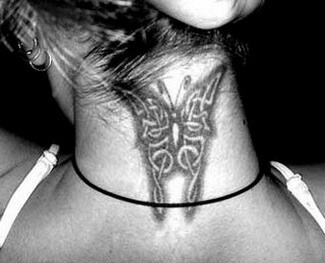 A butterfly tattoo does not have to be big to be beautiful and striking. 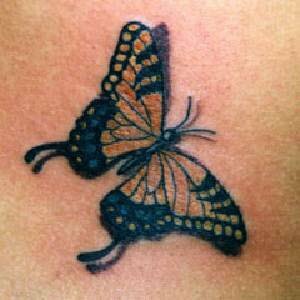 Butterfly tattoos can imitate the real creature in nature or something imaginary. Some of the more popular and creative butterfly tattoo designs incorporate the butterflies in with other symbols, such as flowers, leaves, fire and fairies. Some women choose to have butterfly wings on a fairy or angel to create a more original appearance.